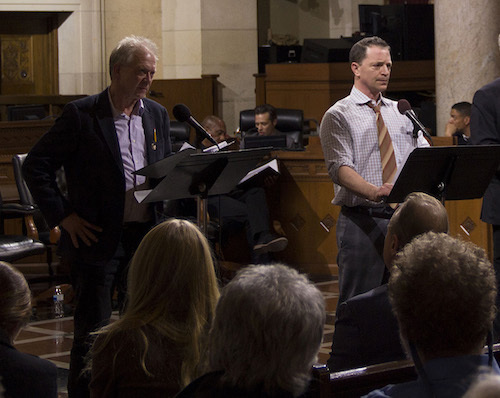 Sam Waterston (Law & Order, The Newsroom, Gracie and Frankie) will join Scandal co-stars Joshua Malina, Jeff Perry and Bellamy Young for a one-night-only, all-star reading of Ms. Smith Goes to Washington at Los Angeles City Hall on Thursday, Jan. 24 at 7:30 p.m. in the John Ferraro Council Chamber, Room 340, Los Angeles City Hall, 200 N Spring St., Los Angeles, CA 90012. Doors open at 6 p.m. The gender-switched adaptation of Sidney Buchman’s screenplay for the 1939 Jimmy Stewart classic Ms. Smith Goes to Washington is adapted and directed by Fountain co-artistic director Stephen Sachs. The free reading is being presented by the Fountain Theatre in partnership with the City of Los Angeles and with exclusive permission from SONY Pictures. It will be hosted by Los Angeles City Councilmember Mitch O’Farrell and will take place in the John Ferraro Council Chamber of Los Angeles City Hall. A catered reception will follow in the City Hall Rotunda. In Sachs’ version, an idealistic, newly elected female senator finds herself fighting corruption in male-dominated Washington. Young will star in the title role, and Waterston has been cast in the pivotal role of Senator Paine. The full cast includes Joshua Malina, Jeff Perry, Bellamy Young, Sam Waterston, Alan Blumenfeld, Gilbert Glenn Brown, Leith Burke, Tim Cummings, Cameron Dye, Spencer Garrett, Chet Grissom, Morlan Higgins, Aurelia Myers, Jenny O’Hara, Felix Solis, Jack Stehlin, Mark Taylor and Sal Viscuso. The event is a follow-up to the Fountain’s hugely successful 2018 celebrity reading of All the President’s Men. It is sponsored, in part, by the Feminist Majority Foundation and in association with the League of Women Voters. Ms. Smith Goes to Washington takes place on Thursday, Jan. 24 at 7:30 p.m. in the John Ferraro Council Chamber, Room 340 of Los Angeles City Hall, 200 N Spring St., Los Angeles, CA 90012. Doors open at 6 p.m. Admission is free; however, seating is extremely limited. For more information, and to enter the ticket lottery, go to www.mssmith.org. Due to high security at the venue, no walk-ups will be permitted. Wish I could see this. Interesting concept and great cast.